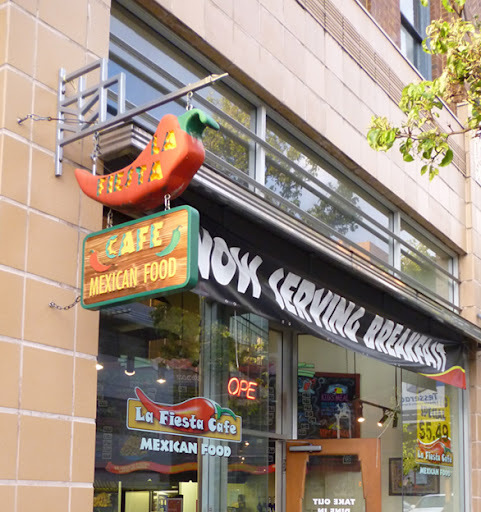 La Fiesta is a corner diner that I tend to visit from time to time, and I’ve always enjoyed their burritos. They’re super sized and it has been many months since my last visit. The taco dinner platter ($10) I enjoyed consisted of two overstuffed tacos and a good heap of taters. In the menu, these potato tots are called Mexi-fries, Honestly, I do not think there is such a thing as a Mexican french fry. It may be an American invention. While they are enjoyable to eat, I think a trip to Mexico proper is in order to find out what is truly in their street food cuisine. I’d be eating up bugs, especially caterpillars, at the same time with my potatoes, and other than adding spice to the mix, eating either, especially crickets, can be called my guilty sin. I love the crispiness of a well done tater. It had a comforting hot center and satisfying crispiness to them. And they were modestly spiced with black and white pepper. The tacos, with the corn salsa, really hit the spot. I tried a bit of their Habanero Salsa and even a tiny amount was enough to get me nicely steaming. And tomatoes must be coming into season again, because unlike other places where I thought gophers were attacking the crops, the types they use here are better than. They’re not altogether perfect since the local ripening season is not here yet, but I’d come back here for more. Given my past arguments of wanting to enjoy an overstuffed taco than a puny one, this place is super sizing them. The 7” shells are nearly crammed to capacity. Okay, while I’m biased towards Western-run operations offering ethnic food, at least I’m getting my money’s worth here. Now send me to Mexico, and I’ll be eating tortillas every day of the year! This entry was posted in Food, Reviews and tagged Dinner, Downtown Victoria, Lunch, Mexican, Take Out / Take Away. Bookmark the permalink.